Water caltrop is a sweet, crunchy and heavy kind of fruit. This fruit belongs to the kingdom Plantae and Lythraceae family. The binomial name of water caltrop is “Trapa natans”. Most of the humans and animals get fascinated towards some fruits because of its attractive and colorful appearance. It is also known as panifal singhara or water chestnut or buffalo nut. But this fruit “Water caltrop” is not so attractive but is full of health benefits. It is olive green or magenta in colour. It is also called; water chestnut, singhara, pani-phal, devil pod and so on. 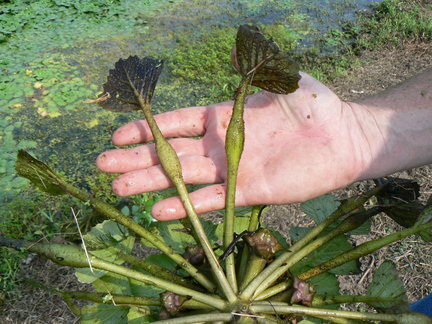 This fruit belongs to the species of floating annual aquatic plants. Mainly this fruit is grown in the damp, marshy water bodies. Water caltrop has many benefits. Prevents goitre and thyroid problems– As we know thyroid ailments such as goiter occurs due to lack of iodine. Water caltrop is rich in minerals like iodine, manganese, potassium and so on. So the intake of this fruit in ample amount make your thyroid health fit and the level of mineral salts become stable. Full of nutrition– Water caltrop is rich in macro as well micro nutrients. Protein, Vitamin B, C, Iron, Carbohydrates, Calcium, Phosphorus, Riboflavin, Magnesium and minerals are abundantly found in it. For senescence and adult age groups this fruit is very necessary diet. This fruit is also rich in many medicinal properties that prevent many ailments such as; sugar, cardiac disorders, ulcers, arthritis and many more. Cures tonsils- This fruit is also used in medical application. 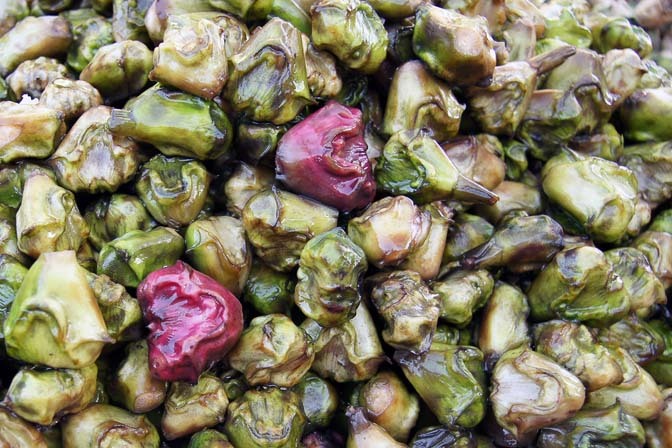 Intake of fresh water chestnut as a fruit and its grind powder both are the remedy for tonsils. As we discussed earlier, water caltrop contains iodine that makes our throat water and detoxifies it. Remedy for cracked heels and lips– As we know, when our body suffers from dehydration our sensitive skin like lips, heels gets rough and cracked. There is also another reason for cracked skin that is lack of manganese in our body. So, the regular intake of this water caltrop fulfills the need of manganese and its optimum water content keeps our body hydrated. Good for pregnant ladies– Those ladies who suffer from cervix weakness and excessive secretion of bile should consume this fruit in regular basis. It is really a matter to concern; because of their weakness the womb is not able to hold a new life. And gradually, miscarriages occur. Water caltrop is a simple fruit but is the remedy for dangerous ailments. This fruit helps the follicle tissues to get strengthen and is a nutritious placenta for the baby. Not only this, water caltrop should be regularly consumed by the pregnant females, as the baby becomes strong and beautiful. Good source of energy- Water caltrop contains optimum amount of dietary fibers in it. It is also rich in carbohydrates and calories. This fruit activates your energy cells and helps them to synthesize the food materials. Finally, providing us adequate amount of energy. So guys, by the above description we came to know that this Water caltrop is a simple but a very effective fruit. But beware; its excessive intake is not good. 1. A healthy person can eat 10- 15 gm of singhara daily. 2. Do not eat “singhara” in excess as it may cause stomach pain. 3. Do not drink water after eating singhara at least for 10-20 minutes. 4. If you are suffering from constipation, water caltrop must be avoided as it increases your disorder. So, be healthy and live your life happily. It’s very interesting…. That water caltrop good for health.. . Some people may be don’t know this fruit virtue. it’s awesome.